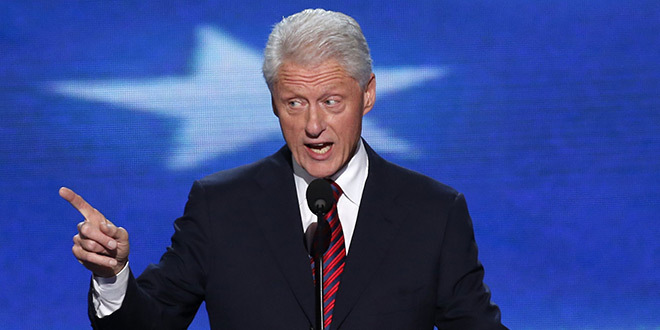 As it has been widely reported, former President Bill Clinton has amassed a staggering $100 million war chest obtained primarily through speaking fees since he left the White House in 2001 (i.e. when he and Hillary were left “dead broke“). You may ask, “How does one earn $100 million giving speeches?” Well, Conan O’Brien and team from the Conan show on TBS looked into the matter and discovered just how Slick Willy has pulled off this amazing feat. What Conan found out is that Bill Clinton secretly negotiates into every speaking engagement special speech “add-ons,” little behavioral flourishes thrown into an address or a lecture to enhance the overall experience for audience members.